Published in 1989, Blueprint for a Green Economy presented, for the first time, practical policy measures for 'greening' modern economies and putting them on a path to sustainable development. This new book, written by two of the Blueprint for a Green Economy authors, revisits and updates its main messages by asking, first, what has been achieved in the past twenty years, and second, what more needs to be done to generate a truly 'green economy' in the twenty-first century? Blueprint for a Green Economy had one over-arching theme. Making economies more sustainable requires urgent progress in three key policy areas: valuing the environment, accounting for the environment and incentives for environmental improvement. Today, with the threat of global warming, the decline in major ecosystems and their services, and fears over energy security, achieving these goals is even more vital. 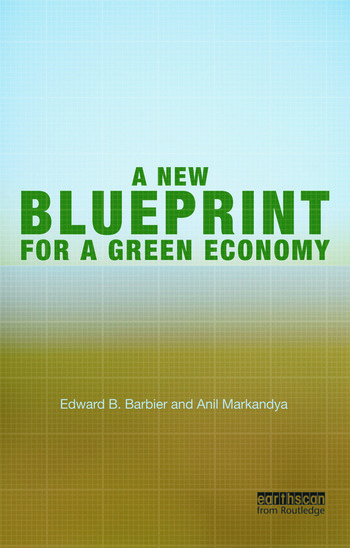 The current book first summarizes the main messages from Blueprint for a Green Economy and explains why, given rapid and widespread global environmental degradation, they are still relevant. The book then examines the progress since Blueprint for a Green Economy in implementing policies and other measures to improve environmental valuation, accounting and incentives. Although much has been accomplished, additional advances are still required to green economies successfully. The book highlights the new policies and approaches needed for economic management of today's environmental concerns. Over twenty years later, A New Blueprint for a Green Economy once again emphasizes practical policies for greening modern economies, and explains why such an economic roadmap to a greener future is essential, if modern economies are to develop successfully and sustainably. Edward B. Barbier is the John S. Bugas Professor of Economics at the University of Wyoming, USA. Anil Markandya is Scientific Director at the Basque Centre for Climate Change, Spain.